It is with broken hearts we announce the passing of our beloved wife, mother, daughter, grandmother, sister, niece and friend, Theresa Swampy, who passed away at the Selkirk Hospital after a courageous battle with cancer on August 13, 2018 at the age of 50. 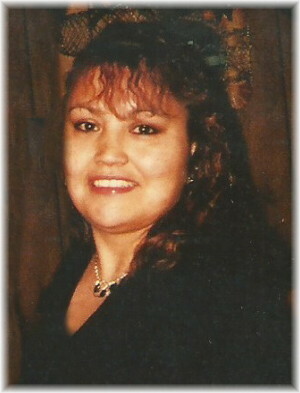 She leaves to mourn her passing her partner of 19 years, Vernon (Panzy) Fontaine and her mother Margaret (Peter) Bunn. She will be fondly remembered by her children, Matthew (Melissa), Barry (Cheyanne), Caitlyn (Mike), Tommy Jr. and her grandchildren Andre and Hailey. She will also be remembered by her step-daughter Chelsea (Al), step-grandson Kashtyn and step-son Jaden Fontaine. She is survived by her siblings, Linda, Lloyd (Winona), Calvin (Leslie), Trevor (Stefanie), Brenda (Rob) and Mark. She is predeceased by her daughter, Leanne Swampy; her father, Leslie Desjarlais; her brother Kevin and her grandfather J.B.
A wake service will be held from Tuesday, August 14 to Wednesday, August 15 at Theresa’s mother’s house, 1417 North Shore Road. A second wake service will be held at Theresa and Vernon’s house from Thursday, August 16 to Friday, August 17 at 22 Dream Drive, North Shore. Funeral service will be held at the Fort Alexander Roman Catholic Church on Saturday, August 18, 2018 at 2:00 p.m. I am sorry for your loss Caitlyn, Mike and Andre. Also to the rest of your family. You’re in my thoughts and prayers. Deepest sympathy to Matthew, Barry, Caitlyn & Tommy on the loss of your Mother. Our thoughts & prayers are with you & your families.